Deciding to transition from a military to civilian career can be both exciting and a little scary. Perhaps you are concerned that the skills you developed serving our nation are different than those you need for civilian jobs. The truth is, many types of military jobs fit well into the civilian world, such as those related to engineering and technology. However, even if those are not your areas of specialization, there are still plenty of other career opportunities. Below are some large and successful companies that actively hire United States veterans. These companies value military experience and the traits that veterans possess such as flexibility and being a leader, team player, quick thinker and problem solver. Some companies have recruitment events specifically geared toward transitioning military, while others have special initiatives and mentorship programs designed to help service members make a smooth crossover to a civilian profession. Take a look at these companies below and then imagine the possibilities for your post-military career! Have you served in the military? There are many large & successful companies that are actively hiring U.S. veterans. They value your military experience and can help you make a smooth career transition. AECOM – The federal contractor AECOM employs more than 9,000 United States veterans on projects around the globe. It is a recipient of several awards honoring the company’s committing to hiring military veterans and service members. AECOM values the training, experience and perspectives of the military and the company looks for passionate people ready to make an impact. Allstate – This insurance company values your military service and has a free training program, Joining Forces for Good, that can help you become a licensed sales professional or an Agency Owner. To qualify for the program, you need to be an honorably discharged veterans, active duty, Reserves, National Guard or a military spouse. A college degree is not necessary. Allstate also has a one-on-one Veteran Mentoring Program to help you plan your career. Farmers Insurance – This U.S. insurer group is recognized by the Department of Defense and according to MilitaryFriendly.com is one of the top 150 military employers. One in four Farmers agents is a veteran and the company has the Veterans & Advocates resource group to help transitioning military. The company understands how to translate your military skills to jobs in the company and continually looks for ways to improve job opportunities for veterans, guardsmen and reservists. FirstEnergy – More than 1,400 current and former U.S. military members are employed by FirstEnergy, one of the nation’s largest investor-owned electric systems. FirstEnergy has been recognized as a Military Friendly® employer by G.I. Jobs magazine and offers support and valuable benefits to employees who are members of the military reserves and National Guard. The company also attends military fairs and participates in the Transition Assistance Program (TAP) Employer Panels which help veterans make a smooth transition to civilian life. IBM – IBM was recognized as the Military Friendly® Employer of the Year for 2018 by Victory Media. IBM has a commitment to hiring 2,000 veterans by the year 2020 and holds recruiting events at military bases around the country. 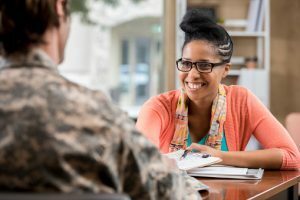 The multinational technology company believes that veterans make great IBMers and offers special training programs that give transitioning military an opportunity to enhance and develop new skills for use in the marketplace or job field. PricewaterhouseCoopers (PwC) – Recognized as Military Times’s Best for Vets Employer in 2017 and a Top 100 Military Friendly Employer since 2011 by G.I. Jobs magazine, PricewaterhouseCoopers is committed to the military community. The assurance, tax and advisory services company values the skills that veterans can offer and has established the Veterans Affinity Network (VAN), which helps military harness their unique talents and capabilities. Military have recently been hired by PwC in areas includingcybersecurityy and privacy, technology consulting, risk assurance, information technology, human resources, market, tax reporting, sales and many others. Verizon – This leading global communications technology company was ranked the #1 Military Employer by Military Times. More than 11,000 veterans have been hired at locations around the world. Its website features a resume building where you can translate your military skills into a civilian resume and a military skills matcher tool to search for Verizon careers that match your military experience. You can also contact a military recruiter, many who are veterans and who understand your needs and questions. Omni Financial is also a company dedicated to hiring veterans! Most of our staff members are affiliated with the military, and many are former service members. Learn more about Omni job opportunities.